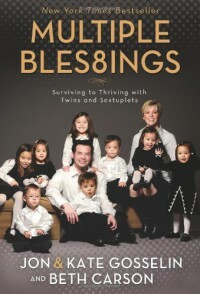 I read this book back in '08, before the Gosselin divorce. At the time, I liked the book and found it to be a touching story of a family's persistence to stick together and thrive, no matter what it took. Especially cute were some of the personal stories, like one I can recall about how they decided to name their kids.Fast forward 3 years. I haven't watched the trainwreck of a show in at least couple of years. I can't pretend to know what it's like to raise multiples, and know I'd have a hard time with it because I struggle with the two I have already! But...I've lost a lot of respect for the family after they continued to ride the gravy train for years, past the point of a place where it might not be the best thing for the kids mentally, especially after having to deal with the paparazzi circus following the Gosselins' divorce. Should this affect my judgement of a book I read 3 years ago? Maybe not, but everything is connected when a book is trying to sell you something that might not be true.1 star for my disappointment in how everything has turned out, but the book itself was an interesting read at the time, maybe 3.5 stars, so I'll go with 2 stars total.Good luck to you Gosselins. Here's hoping that you'll find your peace someday, away from the hand of the media. God bless those kids, and I really hope they grow up to be strong individuals who are able to handle the fallout.